We were pleased to recently work with both Bride and Groom, Emma and Ben, to create their ideal hair ahead of their wedding. 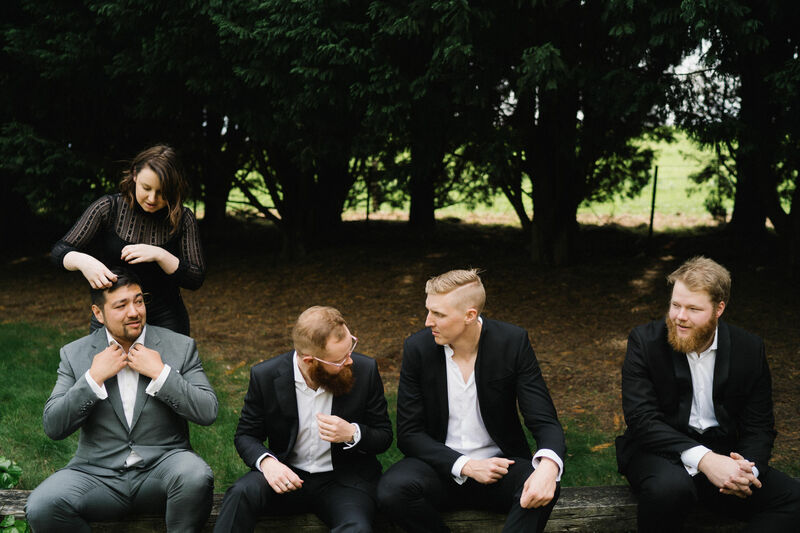 The Director from our Camden salon, Lemai Wilson, helped the bridal party prepare for their beautiful garden wedding, held at The Secret Garden in the stunning Southern Highlands. We welcomed the Groom, Father of the Bride and Groomsmen into our Camden Salon ahead of the wedding. This was a great bonding opportunity and a chance for all the boys to tidy up their beards and hair before of the big day. On the day of the wedding, Lemai made sure that each of the boys looked their best with last-minute grooming and a simple style. On the day of the wedding, we created a stunning look for our Bride Emma, the Mother of the Bride and her Maid of Honour. Each of these lovely ladies went for a textured curled style, while a tasteful floral hair piece in Emma’s hair completed her timeless bridal look. For the Maid of Honour, Claire we created loose waves and a small braid to create some shape and texture around her face. This simple style created a tasteful coordination with the bride’s hairstyle, perfect for bridal photos. For the Mother of the Bride, Kathy, we began working on her hairstyle months in advance as she transitions her colour from a medium-brown to grey, accentuating her graceful aging. If you’re interested in transitioning to your natural hair-colour speak to your Hair by Phd stylist today! For our bride, her hair requests were simple. She desired some volume and a light wave, enough to add movement and body, unlike her natural dead-straight hair. Emma has been a loyal client of Hair by Phd for many years, we have watched her transition her colour from reds to pinks through to purples and back again. Ahead of the wedding, we organised a personalised growth and colour plan for Emma to ensure her hair style was picture-perfect for her big day. This stunning yet simple hairpiece, by Kate from Two Wild Hands, completed Emma’s bridal hairstyle. Not only did the floral comb add to the timeless aesthetics of the Bride’s styling but also ensured Emma’s hair was off her face throughout the day. The natural floral touch to her look was accented by Emma’s vibrant red hair colour and tied in perfectly to the garden wedding theme. Despite a bit of wind and rain during the day, the two lovebirds looked picture-perfect with their hair styled by Hair by Phd. 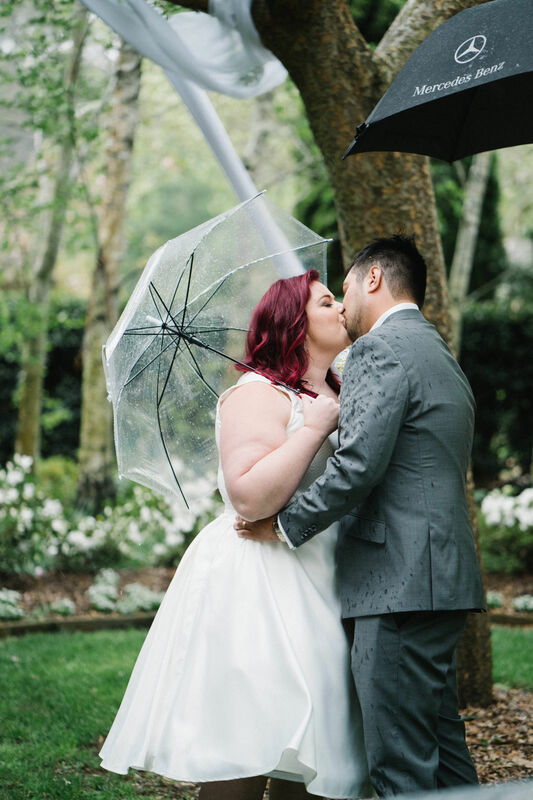 Rain is always going to be an issue for hair on your wedding day, and so are the hundreds of hugs and the endless dancing. The key is to have a few structural elements, like Emma’s hair piece, tastefully holding her style in place. While her bold hair-colour allowed her simple choice in textured waves to make a unique and quirky statement, complimenting her classical look. Thank you so much, Emma and Ben, for letting Hair by Phd be a part of your wedding day. We love working with bridal parties to help them complete their wedding styling and achieve their desired hairstyle on their special day. Get in touch with the team from Hair by Phd Bridal to book your wedding hair today. Before I met the lovely Miss Danika (pictured above), I must say I was a bit sceptical about cosmetic tattooing, mainly because I didn’t know a lot about it. Now after seeing how she has transformed Lemai’s eyebrows (our Salon Director at Camden), I am a true convert. Lemai pictured below far right. When I left Lemai, as Miss Danika was about to start tattooing, Lemai was feeling a tad anxious. I called her later in the day and asked her to send me photos of the end result. Once I saw them I was a bit shocked at first because they were a bit darker than I anticipated. However after a few days they had settled and the result was amazing. She had beautiful eyebrows without having to paint them on every day. “Did it hurt?” was my first question. Lemai mentioned that Miss Danika had used some numbing cream and it did not hurt at all. Bonus! You can have your eyebrows, eyeliner and lips transformed with this amazing service. The tattooing is semi- permanent, which is great as it lasts. It’s also very natural looking and there are multiple colours to choose from. The images below are of Lemai two months after the treatment. See below the list of services and prices. Enjoy the images above for Lemai’s before and after as well as some of Miss Danika’s other work. Call our salon on 4622 1260 or email us camden@hairbyphd.com.au to make a time with Miss Danika and have a chat with her on how this amazing service can transform you. Wow! That has gone so fast it’s crazy. On June 13 2018, Hair by Phd Camden will turn one. It has been an amazing ride for salon Director Lemai Wilson. Lemai, who worked for many years at Hair by Phd Parramatta, has become Camden’s hairdresser of choice. In a very short time, Lemai has managed to build a great little salon in Camden. With three team members now she has really made her mark on the area. This is not always easy starting a salon from nothing in a new area where you haven’t worked before. Through her amazing skill as a hairdresser and her beautiful personality, Lemai has become a sought-after stylist in the Camden area. We are also very lucky to have one of Australia’s top colourists join the team on a part-time basis. Damien Rayner, the Balayage King, has been weaving his magic in our Camden Salon. As part of our first birthday celebrations, we have an amazing give away for everyone who visits the salon this month. For every visit you will get an entry to WIN a hair and beauty pack valued at $500. PLUS every time you buy a take-home hair care product, we will give you an extra entry in the draw for every product you buy. The pack includes products from Kerastase, Lancôme and Bvlgari, an incredible luxury prize pack to celebrate our beautiful salon. The prize will be drawn on Saturday July 14 2018, so make sure you visit our lovely Hair by Phd Camden Salon and purchase some deluxe products for your hair to go into the draw to WIN! Also if you have a friend you would like to recommend to Hair by Phd Camden, we are giving away a FREE hair, colour and scalp analysis/consultation with our expertly trained stylists. We will literally put your hair and scalp under the microscope for an in-depth diagnosis. Damien Rayner will be available for this particular service on every Friday if you or a friend would like to have your colour consultation with him. The salon offers a range of hair services, specialising in Balayage, colour correction, tape hair extensions and specialist treatments like Olaplex and Keratin Smoothing. We have the best in hair products featuring Kerastase, Schwarzkopf, Cloud Nine and more. Come and join Lemai and the team in the celebrations, the bubbles will be flowing and we look forward to being at your service at Hair by Phd Camden. You have all heard me talk about him. Damien Rayner has been working with team Hair by Phd for over seven years now, educating the team on all things hair colour. I am very proud to announce that Damien will now be joining Lemai and her team at Hair by Phd Camden. This is not only exciting for us but for the Camden community to have a Hair Colourist of Damien’s elk working in the area. Voted in the top 15 Australian hair colourists by Harpers Bazaar, Damien is one of the nicest guys I have met in the industry, and a magician when it comes to Balayage. He has worked at some of Australia’s top salons, not to mention done stints in New York and London. Damien moved into the Camden/Narellan area a few years ago with his partner for a lifestyle change and continued to commute to the city for work. Through our long-term relationship, it was a natural fit when it came to securing his services at our Camden salon. What does that mean for you? 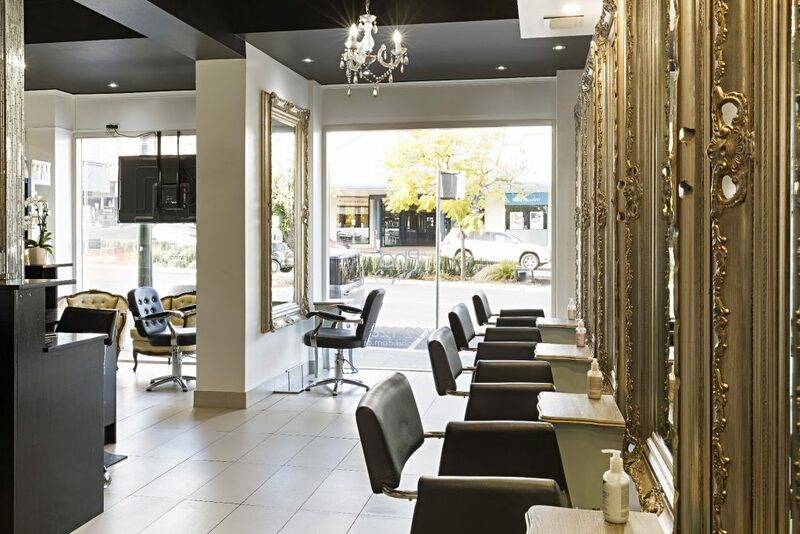 Well if you live in the area or surrounding suburbs, you do not have to trek into the city anymore to find a quality Hair Colourist. The best has come to town. Damien is not only the Balayage king; his skills are just as superior in all aspects of hair colour. From Balayage, Ombre, colour makeovers, foil highlighting and more, Damien is the colour expert. And best of all, we have an amazing offer for anyone who would love to have his or her hair coloured by Damien. You will receive a complimentary in-salon consultation, so Damien can assess your hair and create a plan for your desired look. This also allows Damien to determine the time needed for your colour appointment. You will also receive a complimentary bottle of Schwarzkopf BC Shampoo and Conditioner valued at $53.90, which can be upgraded to a Kerastase Shampoo and Conditioner if desired. Damien and Lemai look forward to seeing you in our salon located at Shop 2 Albert Baker Arcade 165-167 Argyle St, Camden.